Assuming only a general science education this book introduces the workings of the microprocessor, its applications, and programming in assembler and high level languages such as C and Java. Practical work and knowledge-check questions contribute to building a thorough understanding with a practical focus. The book concludes with a step-by-step walk through a project based on the PIC microcontroller. The concise but clearly written text makes this an ideal book for electronics and IT students and a wide range of technicians and engineers, including IT systems support staff, and maintenance / service engineers. Crisp's conversational style introduces the fundamentals of the micro (microprocessors, microcontrollers, systems on a chip) in a way that is utterly painless but technically spot-on: the talent of a true teacher. 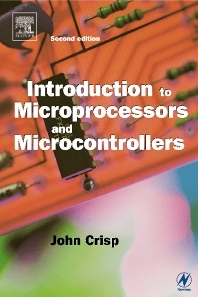 Microprocessors and microcontrollers are covered in one book, reflecting the importance of embedded systems in today's computerised world. *Practical work and knowledge-check questions support a lively text to build a firm understanding of the subject.